La Quercia's Pancetta Americano for sale. Buy online at Zingerman's Mail Order. Gourmet Gifts. Food Gifts. Meatier pancetta from La Quercia. If you're used to Italian-style pancetta—the unsmoked, rolled belly of pig—La Quercia's excellent Pancetta Americana has a few differences worth noting. First, it's meatier. While there's still a significant amount of pale white fat, as there should be (which glows gorgeously translucent when cooked), there's more pork to sink your teeth into. Second, it's cured, not fermented. That means there's no skin, the texture is smoother, the flavor sweeter. In fact the aroma alone is worth the price of admission. Finally, in the case of whole pieces, La Quercia leaves their pancetta unrolled, so, whole, it looks like a large slab of American bacon. 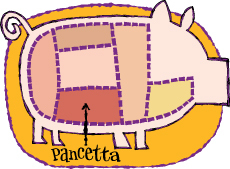 One of our crew calls pancetta "bacon's older brother," which I think is a great description. You can enjoy Pancetta Americana as is, sliced thin, as part of a salami tray. Or buy a chunk and cut it coarsely and cook it with vegetables. Any way you'd use Italian pancetta you can use Pancetta Americana. If you're adventurous, use it instead of American bacon too. La Quercia cuts the whole piece of pancetta by hand from a larger piece. We ship it frozen. It will last weeks in your refrigerator, months in the freezer. The sliced pancetta is from rolled pancetta. It comes in a nitrogen-flushed pack and lasts for weeks in the refrigerator.